Kontentino is a cloud-based social media management tool designed to enable collaboration between social media teams or agencies and their colleagues and clients. All social media posts formats are supported, including 360 videos and image carousels. Users can plan, schedule, create, and manage budgets for social posts, and clients can review and approve posts in the calendar from anywhere. Increase in quality, engagement, organic number of followers.I have tested almost all platforms that you can find on the web, as I'm working online from 1999. There are some great solutions for publishing and also analysis, tracking, really great solutions. And they are famous too. 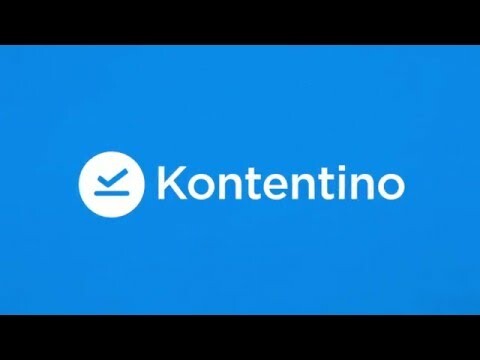 But when it comes to the crucial phase of preparing for Social Media, like content creation and planning, Kontentino is unique. You can save your ideas, work on them, reuse what you've already done, you can even translate through Kontentino for the international brands. You can check with your team every step (defined perfectly), like content creator, graphic designer, who is collaborating with the team. All the features are wonderful. You can add the logo and place it on the image in Kontentino. You can have albums, categories, tags, plan your budget, get the approval. It's incredible the list of features you can choose from and make your own "formula" for work, documenting every step of the process. It's for serious work and serious results. My secret "check up" with Kontentino is when I have a client that loves to be organized, love perfectionism and diligence, I know that the last step, the ability to make right decisions is there, as well as 99% for success! You can use it for Twitter (I've started with), Facebook, Instagram, LinkedIn, Google+ and Pinterest. And last but not least, the support is fantastic! This platform comes from the experience and is the Solution for your needs when it comes to working with clients! That's why it's so good. I have tested almost all platforms that you can find on the web, as I'm working online from 1999. There are some great solutions for publishing and also analysis, tracking, really great solutions. And they are famous too. But when it comes to the crucial phase of preparing for Social Media, like content creation and planning, Kontentino is unique. You can save your ideas, work on them, reuse what you've already done, you can even translate through Kontentino for the international brands. You can check with your team every step (defined perfectly), like content creator, graphic designer, who is collaborating with the team. All the features are wonderful. You can add the logo and place it on the image in Kontentino. You can have albums, categories, tags, plan your budget, get the approval. It's incredible the list of features you can choose from and make your own "formula" for work, documenting every step of the process. It's for serious work and serious results. My secret "check up" with Kontentino is when I have a client that loves to be organized, love perfectionism and diligence, I know that the last step, the ability to make right decisions is there, as well as 99% for success! You can use it for Twitter (I've started with), Facebook, Instagram, LinkedIn, Google+ and Pinterest. And last but not least, the support is fantastic! This platform comes from the experience and is the Solution for your needs when it comes to working with clients! That's why it's so good. The team behind Kontentino is great. Their customer centric thinking is a real added value. The tool itself is constantly improving, new features are implanted and it really makes my work easier, it's also more efficient for the client. As well, all feedback and older versions are available and visible, nothing will get lost in emails and exceldocs. - It's very easy to use. Clients, copywriters, .. For everybody it's very straight forward - It looks good and professional - There is a good overview of all the pages and the posts - Customer care replies almost directly and always helps you out - The team is willing to think along for future features. - It's very easy to use. Clients, copywriters, .. For everybody it's very straight forward - It looks good and professional - There is a good overview of all the pages and the posts - Customer care replies almost directly and always helps you out - The team is willing to think along for future features. We use Kontentino as a social media publishing tool in Exponea. I like how easy it is to use - it represents a great way for any business to syndicate their content to all the major social networks. When it comes to organizing and executing on your content strategy, you would be hard pressed to find a solution better than Kontentino. The scheduling and integrations make it easy to share your content across channels in order to make sure you increase the reach of your audience. I also appreciate the smooth approval process of the post - from copy creation, graphic design, final approval by management and scheduling. Starter: €9/month - 1 user, up to 3 social media profiles. XS: €49/month - 3 users, up to 10 social media profiles. Small €99/month - up to 10 users, with unlimited social media profiles. Medium: €189/month - up to 20 users, with unlimited social media profiles. Large: €279/month - up to 30 users, with unlimited social media profiles. Tailored Enterprise plans are also available. The drag-and-drop calendar allows users to schedule, reschedule, and duplicate social media posts. Users can create and preview a range of post types as the would appear on LinkedIn, Facebook, Twitter, or Instagram, including carousels and 360 videos. Post checklists assist users in creating consistent, on-brand content. Instagram posts can be created and scheduled, with Kontentino’s mobile app automatically notifying users when it is time to send the post live. Clients can comment on and approve work, with separation of internal and client comments, and tracking of all changes and approvals in post timelines. Below are some frequently asked questions for Kontentino. Q. What type of pricing plans does Kontentino offer? Q. Who are the typical users of Kontentino? Q. What languages does Kontentino support? Q. Does Kontentino support mobile devices? Q. Does Kontentino offer an API? No, Kontentino does not have an API available. Q. What other apps does Kontentino integrate with? Q. What level of support does Kontentino offer?